The Lüdinghausen Gate - Dülmen's landmark. Dülmen is a medium sized town in the German state of North Rhine-Westphalia. 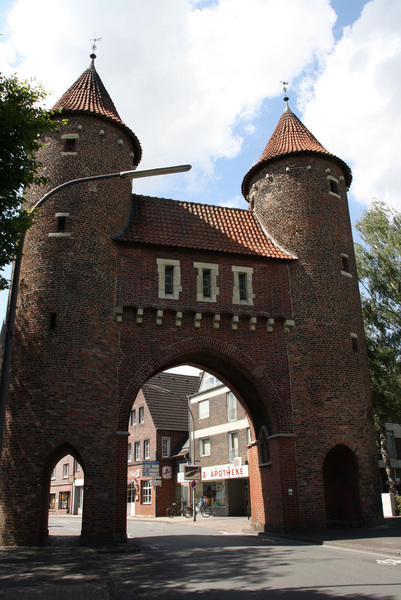 Dülmen has about 47,000 inhabitants and it is the largest town in the county of Coesfeld. The city is located in the Münsterland between the Hohe Mark Nature Park, the hills of the Baumberge, the city of Münster and the Ruhr area. Dülmen is composed of seven boroughs: Dülmen-Mitte, Kirchspiel, Buldern, Hausdülmen, Hiddingsel, Merfeld and Rorup. In 1975, those boroughs were incorporated into the town of Dülmen. But until today, each borough has its own personality, its own lifestyle and identity. Especially the wide range of clubs and organizations shapes the social structure in the individual neighbourhoods. Dülmen is known far beyond the borders of North Rhine-Westphalia as the "town of the wild horses". A few kilometres west of the town lies the home of Europe's last wild horses in the Merfelder Bruch. 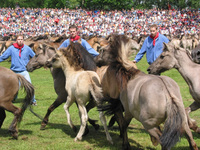 The Dülmen Ponies in action. The fenced Wild Horse Sanctuary of the Merfelder Bruch covers an area of 3.5 square kilometres. The terrain has meadows and grassland as well as marsh, heathland, birch, oak and coniferous forests. This offers a wide range of food and also an adequate coverage and protection for the horses. There, the ponies live completely on their own. 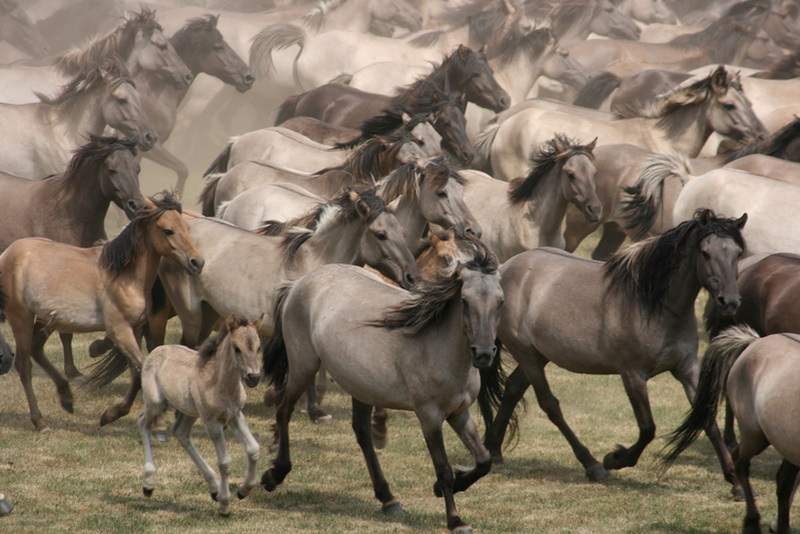 The herd - both adults and foals - consists of approximately 300 animals. Only in extremely cold and long winter periods the horses get hay at some feeding sites. Accustomed to a life in the open, the animals do not need any stables. They find refuge from snow and rain underneath the treetops. The annual trapping of the wild horses. Their thick winter coat protects the animals from the cold. The horses have to cope with disease and birth withou veterinary assistance. Thereby, they are subject to natural selection. A remarkable event is the annual trapping of the wild horses, which always takes place on the last Saturday in May. Thousands of visitors witness courageous men separating the young stallions from their herd. This is necessary to prevent inbreeding and struggles between the stallions. The captured males are sold to the highest bidder and some are offered in a raffle. 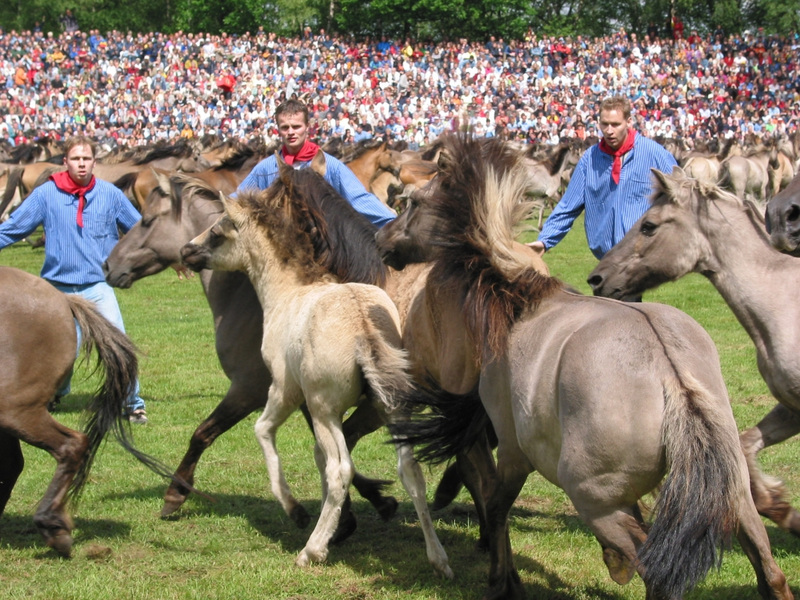 After a thorough training, the Dülmen Ponies are robust and steady horses for recreational riding. Dülmen offers a wide variety of recreational activities to visitors and tourists. 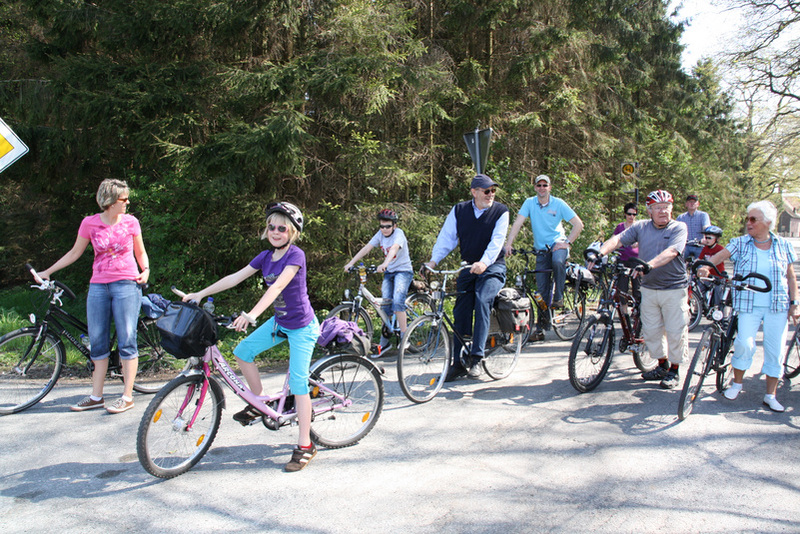 Dülmen has an extensive network of bicycle paths, which invites you to go for long bike rides through the Münsterland. The network of bicyle routes invites to go for long bike rides through the Münsterland. Marked tours with a total of 485 kilometres provide an exciting and enjoyable leisure activity. Alongside the routes, you can find many natural treasures and numerous sights, as well as cozy cafes and restaurants. Those of you who prefer a more urban environment, are invited to visit the city centre of Dülmen. From the the market square, you can scroll through the streets to do some shopping, sit down in cafés, bistros or pubs and enjoy a snack or a beverage. The "Dülmener Sommer" - a cultural highlight. Dülmen has a vibrant and diverse cultural community. In comparison to the town's size, the amount of cultual events is amazing. Locals and visitors alike enjoy the many concerts, children's theatre plays, cabaret and comedy shows, dance and theatre performances. The cultural experience is completed by thrilling readings, interesting lectures and numerous exhibitions. Annual Highlights are the “Dülmener Figurentheatertage” (puppet theatre festival), the culinary and cultural experience of “Dülmen à la carte”, the theatrical and musical festival "Dülmener Sommer" as well as the atmospheric "Dülmener Winter", which consists of an ice skating rink, a traditional Christmas fair and many seasonal events. Jürgen Heilken and Paul Kramer of Dülmen's Business Development Agency will be pleased to advise you! Many innovative and internationally oriented companies are located in Dülmen. They stand out due to highly qualified employes and exceptional performances. A mixture of industrial, commercial and trade businesses guarantees a modern economic structure. The development of industrial and commercial parks further strengthens Dülmen's economy. As a business location, Dülmen has an easy access to the nearby motorways and main roads. The airports of Münster-Osnabrück, Dortmund and Cologne can be reached quickly. 09.00 a.m. - 6.00 p.m.
09.30 a.m. - 1.00 p.m.